One group that attended last weekend's Drum Corps International World Championships could give any DCI group a run for its money in the "road-warriors" category. The three producer/engineers that run the John Lennon Educational Tour Bus spend 10 months a year living out of the Bus, logging more than 70,000 miles as they bring the professional recording experience to students all over the United States and Canada. The Bus is a fully outfitted, mobile recording and editing studio that has seen the likes of Fergie and the Black Eyed Peas – and hundreds of high school students experiencing professional-level recording for the first time. When the Bus pulls up at a school, the producers guide the students through the process of developing musical ideas, recording and editing sound, and even shooting a music video. 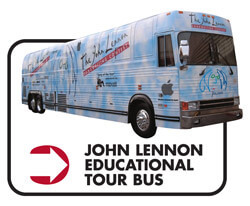 At the end of the day every student gets to take home a CD with everything they've created, and every track goes up on the John Lennon Educational Tour Bus Web site, LennonBus.org, and on the iTunes music store as a downloadable podcast. The bus and its mission are sponsored by a number of music industry companies, including NAMM, Native Instruments, Sibelius, Roland, Musician's Friend and Apple, who are responsible for bringing the bus to DCI World Championships. Fans were able to tour the bus and learn about the projects that have been recorded there, and won prizes including Maxell noise cancellation headphones, and various CDs and DVDs. The engineers who facilitate students' recording projects do everything possible to bring the projects to fruition outside the bus. For example, a recent stop at a Native American reservation in Tuba City, Ariz., involved students composing string quartets that were played a week later by the Ethel professional string quartet at a major music festival. In another instance, a group of young musicians came on to record several tracks and, recognizing their talents, the engineers stayed several extra days. "We were all so blown away that we said, let's see what happens if we stay another day, and another day, and ended up recording a full-length album over the course of a week or so," said producer/engineer Jacob Voelzke. "We helped them send it off to Sony and they got signed." The group, Fatty Koo, also went on to have a reality TV show on the cable network BET. Sometimes professional musicians will come into the bus and work with the students, sharing their expertise in the music industry. "A lot of times we have guest artists come on board and record with the students, for example, Bob Weir from the Grateful Dead will come on and record some guitar licks and sing some lines, and give the students his tips on songwriting," Voelzke said. The Bus is celebrating its 10-year anniversary this year and in celebration, has put out a book, "Come Together," which is available through Amazon.com. The bus project is also getting a facelift: a brand new bus, with updated recording gear and a custom-made Roland electronic drum set. The current bus has logged more than 700,000 miles in its 10 years of existence, and the project is hoping to retire it to an educational setting where its mission can be continued. 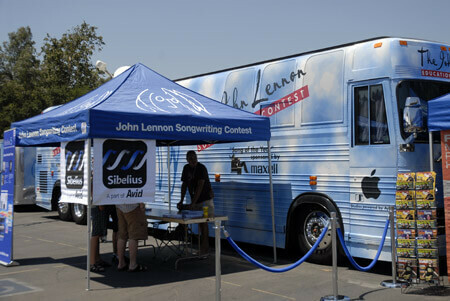 The Bus also sponsors the John Lennon Songwriting Contest open to professionals and amateurs. Prizes include an EMI Publishing contract and a wide array of professional equipment. While recording hit singles with professional groups is professionally edifying for the engineers, the student projects are the most fulfilling. "It means something when you can get a group of students that don't have the chance (to learn about the music industry), and you can show them that they can make money playing electric guitar or as a tour manager, or even just unloading trailers with sound gear," said Voelzke. "Just to open people up to that experience is cool."